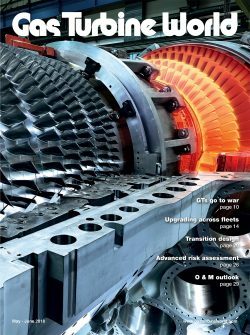 The first GT36 gas turbine – Ansaldo Energia’s advanced H-Class machine – has completed the first phase of a comprehensive validation program. The tests confirm the machine’s high performance and low emissions over the entire load range. 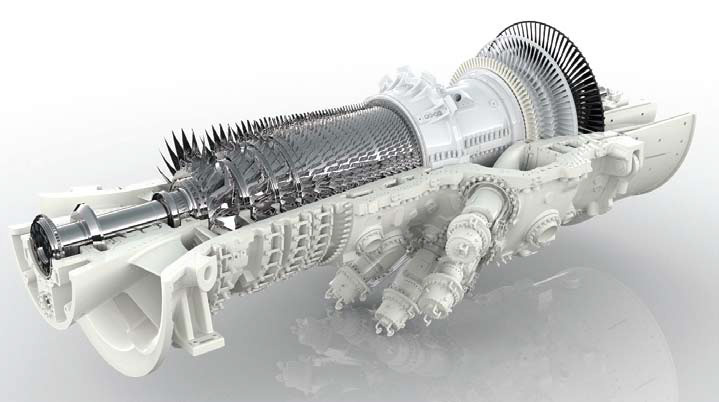 Almost exactly one year after first firing, Ansaldo Energia’s GT36 gas turbine has completed the first phase of a comprehensive validation program at the Birr Test Power Plant in Switzerland. Completion of the validation marks a major milestone in the development of a turbine that began some eight years ago. 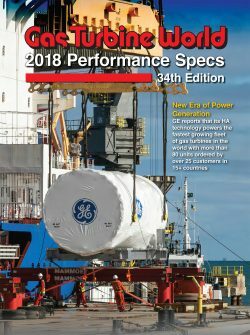 The GT36 is not only the latest addition to Ansaldo Energia’s portfolio but also marks the company’s entry into the Hclass technology market. The GT36 has similarities to the GT26 but with some notable differences. Compressor: While the GT26 features a 22-stage compressor, the GT36 does not have an HP stage and so of the number of compressor stages are reduced to 15. Nevertheless, it has a discharge pressure in excess of 25 bar and a mass flow which is nearly 50% higher than in the F-class machine. The GT36 has the highest compressor mass flow in the Hclass: >1000 kg/s at ISO ambient conditions. The compressor has been designed based on validated advanced design tools. It has four variable guide vanes in order to achieve high efficiency, even in part load, and a wide operation range. Combustion: NOx emissions are becoming increasingly important and challenging due to the higher firing temperature of the H-class, which is needed to achieve higher efficiency. The main drivers for NOx emissions are temperature and residence time, i.e. the length of time the gas is exposed to the high temperature level. The GT36 uses the same sequential combustion approach as its F-class predecessor, the GT26. With sequential combustion – where there are two individual combustor sections – the residence time at the very hot temperatures is thus significantly shorter than with single combustor technology. This allows lower emissions over the entire operation range and consequently a larger emission compliant operation window and lower turndown point. Unlike the GT26, however, the new turbine uses a can combustor rather than two annular combustors (called the EV and the SEV combustor). The 60 Hz version of the GT36 uses 12 cans, while the 50 Hz version has 16 cans. 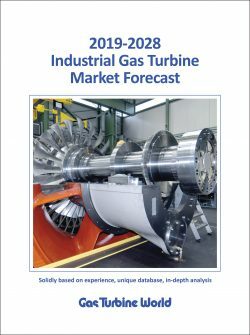 The decision to go for a can combustor is based on the focus to design a service orientated gas turbine. According to Ansaldo, the combustors can be removed without lifting the casing of the gas turbine. Blade 1 has a three-dimensional core design to improve the cooling air effectiveness, which is based on the latest investment casting technologies. The front stage is coated with doublelayer TBC (thermal barrier coating) to allow increased hot gas temperatures. These measures ensure that blade metal temperatures of all stages are kept at a similar level as in the F-class. Consequently, component lifetimes and resulting inspection intervals are within the same range as in the F-class. The GT36’s combustion system had already been tested as a single component in a combustor test rig, at full size and under full mass-flow, at the DLR (the German Aerospace Center) in Cologne since 2013. Testing and validation of the complete machine started in summer 2016 and was finished in early 2017. This process was carried out at the new GT36 Birr, test plant facility in Switzerland. The test power plant is a full-scale simple cycle power station, built in 2015/2016. It can be used for the operation and validation of fully instrumented engines under real power plant conditions, because the power is dispatched to the Swiss electricity grid. The validation engine is equipped with more than 3000 measurement points to monitor stress, strain, vibration, clearances, pressures, temperatures, air and noise emissions and thermodynamic performance throughout the gas turbine across the frequency, temperature and power range. These instruments not only allow close observation of the critical parameters for various parts of the turbine, but also allow the use of such information for calibration of modelling and designing tools. A telemetry system is also set up for recording more than 500 measurements from the rotor and rotating parts. The test program included stress testing of the two stages of the sequential combustion system, part and full load mapping, transient operation and performance testing. Tests confirmed the low emissions of the sequential combustion over the entire load range. MEL (minimum environmental load) is at 25% combined cycle load, while low load parking is at 10-15% CC load. 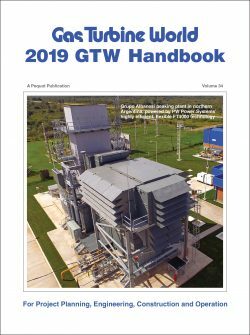 Results reported for the GT36-S6 (60 Hz rating) confirmed power output above 340 MW at 41% efficiency. In combined cycle this corresponds to performance exceeding 500 MW at 61.3% net efficiency in ISO conditions and 720 MW at 61.5% efficiency for the GT36- S5 (the 50 Hz scaled version).